Conleth McConville, Gary Annett, Brian McConville and Naoimh McConville from MJM Marine were presented with the Outstanding Business of the Year award by Richard Donnan, Ulster Bank Head of Northern Ireland and Leslie Buckley, chair of Independent News & Media Group. Photo by Kelvin Boyes / Press Eye. The Irish Football Association won the Excellence in Marketing Award. Photo by Kelvin Boyes / Press Eye. Gary Annett, Conleth McConville and Naoimh McConville from MJM Marine was presented with the Excellence in Exporting Award by Sandra Scannell, Head of Business Services, Northern Ireland Chamber of Commerce and Industry, the category sponsor. Photo by Kelvin Boyes / Press Eye. Darina Armstrong, Caroline Murdock, Jane Millar and Gordon Boal from The Progressive Building Society were presented with the Excellence in the Development of Management & Leadership award by John Linden from category sponsor B4B Telecoms. Photo by Kelvin Boyes / Press Eye. Shane Murphy and colleagues from Oaktree Children's Nursery was presented with an Excellence in Innovation Award from Leeona Galligan, VP of UK Operations, Almac Diagnostics, sponsor of the category. Photo by Kelvin Boyes / Press Eye. Arlene Lyle of Thales UK was presented with an Excellence in Innovation Award from Leeona Galligan, VP of UK Operations, Almac Diagnostics, sponsor of the category. Photo by Kelvin Boyes / Press Eye. Jack Hamilton, Mash Direct, won the Young Business Person of the Year award sponsored by Armagh City, Banbridge and Craigavon Borough Council. It was presented by Deputy Lord Mayor Councillor Paul Greenfield. Photo by Kelvin Boyes / Press Eye. David Maginnes, Oonagh Fearon, Susan Hill and Kiel McGimpsey from Novosco were presented with the IT Company or Team of the Year award sponsored by BT by Heather Wells, Head of Business Marketing at BT in Northern Ireland. Photo by Kelvin Boyes / Press Eye. Gareth Loye, CEO of M&M Contractors received the Best Established Small/Medium Business award from Christine Ourmieres-Widener, Chief Executive Officer of category sponsor Flybe. Photo by Kelvin Boyes / Press Eye. Alexandra Frazer of EquiNutritive won the Emerging Business/Start of Up the Year Award. It was presented by category sponsor Retail NIÕs President Rowan Black. Photo by Kelvin Boyes / Press Eye. Henry Brothers won the Excellence in Corporate Social Responsibility award sponsored by ASDA. Jennifer Cruickshank and Ian Henry from the company were presented with the award by ASDA NI Corporate Affairs Manager, Joe McDonald. Photo by Kelvin Boyes / Press Eye. GCRM-Belfast won the SME Healthcare Business of the Year. Robbie Kerr and colleagues from the company were presented with the award by Kenton Hilman, Head of Corporate and Property Ulster Bank. Photo by Kelvin Boyes / Press Eye. Richard McClean and Richard Donnan from Ulster Bank present the Lifetime Achievement Award to Janet McCollum, Moy Park pictured at the Business Awards. Photo by Kelvin Boyes / Press Eye. Olivia Jennings and Gilbert Yates pictured at the Business Awards. Photo by Kelvin Boyes / Press Eye. Press Eye - Belfast - Northern Ireland 4th May 2017 - Belfast Telegraph Business Awards in Association with Ulster Bank at the Crowne Plaza Hotel, Belfast. Guests at the Business Awards. Photo by Kelvin Boyes / Press Eye. Press Eye - Belfast - Northern Ireland 4th May 2017 - Belfast Telegraph Business Awards in Association with Ulster Bank at the Crowne Plaza Hotel, Belfast. Richard Donnan, Ulster Bank at the Business Awards. Photo by Kelvin Boyes / Press Eye. Press Eye - Belfast - Northern Ireland 4th May 2017 - Belfast Telegraph Business Awards in Association with Ulster Bank at the Crowne Plaza Hotel, Belfast. Richard Donnan and Leslie Buckley pictured at the Business Awards. Photo by Kelvin Boyes / Press Eye. Press Eye - Belfast - Northern Ireland 4th May 2017 - Belfast Telegraph Business Awards in Association with Ulster Bank at the Crowne Plaza Hotel, Belfast. Professor Neil Gibson pictured at the Business Awards. Photo by Kelvin Boyes / Press Eye. Press Eye - Belfast - Northern Ireland 4th May 2017 - Belfast Telegraph Business Awards in Association with Ulster Bank at the Crowne Plaza Hotel, Belfast. Margaret Canning pictured at the Business Awards. Photo by Kelvin Boyes / Press Eye. Press Eye - Belfast - Northern Ireland 4th May 2017 - Belfast Telegraph Business Awards in Association with Ulster Bank at the Crowne Plaza Hotel, Belfast. Speaker Alan Chambers pictured at the Business Awards. Photo by Kelvin Boyes / Press Eye. Press Eye - Belfast - Northern Ireland 4th May 2017 - Belfast Telegraph Business Awards in Association with Ulster Bank at the Crowne Plaza Hotel, Belfast. Lifetime Achievement Award winner Janet McCollum, Moy Park pictured at the Business Awards. Photo by Kelvin Boyes / Press Eye. Press Eye - Belfast - Northern Ireland 4th May 2017 - Belfast Telegraph Business Awards in Association with Ulster Bank at the Crowne Plaza Hotel, Belfast. Darwin Templeton, Richard McClean and Martin Breen pictured at the Business Awards. Photo by Kelvin Boyes / Press Eye. Press Eye - Belfast - Northern Ireland 4th May 2017 - Belfast Telegraph Business Awards in Association with Ulster Bank at the Crowne Plaza Hotel, Belfast. Janet Burns and Hannah Palmer pictured at the Business Awards. Photo by Kelvin Boyes / Press Eye. Press Eye - Belfast - Northern Ireland 4th May 2017 - Belfast Telegraph Business Awards in Association with Ulster Bank at the Crowne Plaza Hotel, Belfast. Theresa McLaughlin and Cathy McGovern pictured at the Business Awards. Photo by Kelvin Boyes / Press Eye. Press Eye - Belfast - Northern Ireland 4th May 2017 - Belfast Telegraph Business Awards in Association with Ulster Bank at the Crowne Plaza Hotel, Belfast. John Paul Corry, Edel O'Neill and John Simpson pictured at the Business Awards. Photo by Kelvin Boyes / Press Eye. Press Eye - Belfast - Northern Ireland 4th May 2017 - Belfast Telegraph Business Awards in Association with Ulster Bank at the Crowne Plaza Hotel, Belfast. Conleth McConville, Naoimh McConville and Brian McConville pictured at the Business Awards. Photo by Kelvin Boyes / Press Eye. Press Eye - Belfast - Northern Ireland 4th May 2017 - Belfast Telegraph Business Awards in Association with Ulster Bank at the Crowne Plaza Hotel, Belfast. Thales Group guests pictured at the Business Awards. Photo by Kelvin Boyes / Press Eye. Press Eye - Belfast - Northern Ireland 4th May 2017 - Belfast Telegraph Business Awards in Association with Ulster Bank at the Crowne Plaza Hotel, Belfast. Richard McClean, Conleth McConville, Naoimh McConville, Brian McConville and Richard Donnan, Ulster Bank pictured at the Business Awards. Photo by Kelvin Boyes / Press Eye. Press Eye - Belfast - Northern Ireland 4th May 2017 - Belfast Telegraph Business Awards in Association with Ulster Bank at the Crowne Plaza Hotel, Belfast. Leslie Buckley , Kenton Hillman, Ulster Bank, Gail Walker, Richard Donnan, Ulster Bank and Richard McClean pictured at the Business Awards. Photo by Kelvin Boyes / Press Eye. Press Eye - Belfast - Northern Ireland 4th May 2017 - Belfast Telegraph Business Awards in Association with Ulster Bank at the Crowne Plaza Hotel, Belfast. Leslie Buckley , Gail Walker, Richard Donnan, Ulster Bank and Richard McClean pictured at the Business Awards. Photo by Kelvin Boyes / Press Eye. Press Eye - Belfast - Northern Ireland 4th May 2017 - Belfast Telegraph Business Awards in Association with Ulster Bank at the Crowne Plaza Hotel, Belfast. Andrew Smyth and John Quinn pictured at the Business Awards. Photo by Kelvin Boyes / Press Eye. Press Eye - Belfast - Northern Ireland 4th May 2017 - Belfast Telegraph Business Awards in Association with Ulster Bank at the Crowne Plaza Hotel, Belfast. Joanne Stuart and Kathryn Thomson pictured at the Business Awards. Photo by Kelvin Boyes / Press Eye. Press Eye - Belfast - Northern Ireland 4th May 2017 - Belfast Telegraph Business Awards in Association with Ulster Bank at the Crowne Plaza Hotel, Belfast. Alan Chambers, Wendy Austin and Richard McClean pictured at the Business Awards. Photo by Kelvin Boyes / Press Eye. Alan Chambers and Richard McClean pictured at the Business Awards. Photo by Kelvin Boyes / Press Eye. Press Eye - Belfast - Northern Ireland 4th May 2017 - Belfast Telegraph Business Awards in Association with Ulster Bank at the Crowne Plaza Hotel, Belfast. Ann McMullan and Grainne McGarvey pictured at the Business Awards. Photo by Kelvin Boyes / Press Eye. Press Eye - Belfast - Northern Ireland 4th May 2017 - Belfast Telegraph Business Awards in Association with Ulster Bank at the Crowne Plaza Hotel, Belfast. Alan Chambers and Sarah Little pictured at the Business Awards. Photo by Kelvin Boyes / Press Eye. Press Eye - Belfast - Northern Ireland 4th May 2017 - Belfast Telegraph Business Awards in Association with Ulster Bank at the Crowne Plaza Hotel, Belfast. Deborah Madden and Charlene Jones pictured at the Business Awards. Photo by Kelvin Boyes / Press Eye. Press Eye - Belfast - Northern Ireland 4th May 2017 - Belfast Telegraph Business Awards in Association with Ulster Bank at the Crowne Plaza Hotel, Belfast. Mary Foran and Rebekah Hamilton pictured at the Business Awards. Photo by Kelvin Boyes / Press Eye. Press Eye - Belfast - Northern Ireland 4th May 2017 - Belfast Telegraph Business Awards in Association with Ulster Bank at the Crowne Plaza Hotel, Belfast. Geoff, Jourdan and Joy Baird pictured at the Business Awards. Photo by Kelvin Boyes / Press Eye. Press Eye - Belfast - Northern Ireland 4th May 2017 - Belfast Telegraph Business Awards in Association with Ulster Bank at the Crowne Plaza Hotel, Belfast. Una O'Neill and Ashleen Poland pictured at the Business Awards. Photo by Kelvin Boyes / Press Eye. Press Eye - Belfast - Northern Ireland 4th May 2017 - Belfast Telegraph Business Awards in Association with Ulster Bank at the Crowne Plaza Hotel, Belfast. Tracy Campbell, Debbie McLorinan and Denise Daly pictured at the Business Awards. Photo by Kelvin Boyes / Press Eye. Press Eye - Belfast - Northern Ireland 4th May 2017 - Belfast Telegraph Business Awards in Association with Ulster Bank at the Crowne Plaza Hotel, Belfast. Julie Flaherty and Arnold Hatch pictured at the Business Awards. Photo by Kelvin Boyes / Press Eye. Press Eye - Belfast - Northern Ireland 4th May 2017 - Belfast Telegraph Business Awards in Association with Ulster Bank at the Crowne Plaza Hotel, Belfast. John Toner, Nicola Clarke and Alan Chambers pictured at the Business Awards. Photo by Kelvin Boyes / Press Eye. Press Eye - Belfast - Northern Ireland 4th May 2017 - Belfast Telegraph Business Awards in Association with Ulster Bank at the Crowne Plaza Hotel, Belfast. Len O'Hagan and John Simpson pictured at the Business Awards. Photo by Kelvin Boyes / Press Eye. Press Eye - Belfast - Northern Ireland 4th May 2017 - Belfast Telegraph Business Awards in Association with Ulster Bank at the Crowne Plaza Hotel, Belfast. Declan Moore, Ailsa McNeill, Lucy Speer and Caroline Murdoch pictured at the Business Awards. Photo by Kelvin Boyes / Press Eye. Martin Lindsay, Margaret Canning and John Mulgrew pictured at the Business Awards. Photo by Kelvin Boyes / Press Eye. Jennifer Cruickshanks and Charlotte Scullion pictured at the Business Awards. Photo by Kelvin Boyes / Press Eye. Karen Fleming, Gillian Masson and Mandy Mitchell-Segerdahl pictured at the Business Awards. Photo by Kelvin Boyes / Press Eye. Mark Fullerton and Michelle Chambers pictured at the Business Awards. Photo by Kelvin Boyes / Press Eye. The chief executive of poultry giant Moy Park - Northern Ireland's biggest home-grown company - has received the Lifetime Achievement Award in the Belfast Telegraph Business Awards in partnership with Ulster Bank. Janet McCollum was honoured at last night's glittering ceremony at the Crowne Plaza in Belfast for making a hugely positive impact in the business community here as well as playing a major role in representing the agri-food industry nationally and internationally. The Belfast-born executive, who is married with three children, has overseen a major expansion in the business, including its growth in the convenience food sector, which has helped drive profits. It is now one of the UK's top 15 food companies, and part of the Brazilian-based JBS Group. Moy Park, based in Craigavon, employs 6,300 people in Northern Ireland and a total of 12,000, including its operations in Europe. It recorded pre-tax profits of £35.7m in 2015. She has been head of the company since 2014, but first joined as European accountant back in 1993. Marine fit-out company MJM Marine in Newry - led by chief executive Gary Annett and chairman Brian McConville - was named Overall Business of the Year, sponsored by Ulster Bank. MJM Marine also triumphed in the Excellence in Export category, sponsored by the Northern Ireland Chamber of Commerce and Industry. The company, which recorded more than £60m in turnover in 2016, has increased employment by 25% and has secured substantial contracts all over the world. MJM Group works for the world's major cruise lines, including Royal Caribbean, Carnival, Norwegian Cruise Lines, Cunard, P&O and Holland America. Last night's event - attended by around 350 of the brightest and best from the world of Northern Ireland business - was hosted by BBC journalist Wendy Austin. It also featured an inspirational speech by record-breaking polar explorer and adventurer Alan Chambers MBE. 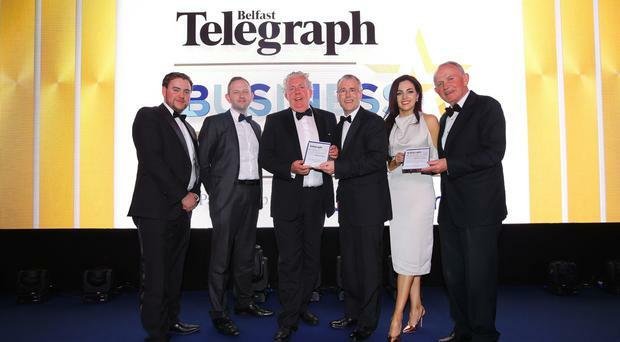 "We are delighted to partner with the Belfast Telegraph for these awards and to help recognise and celebrate the achievements of local businesses. "I had the privilege of being one of the judges and that was an inspiring experience, underlining the calibre of businesses that we have in Northern Ireland and some of the great things being done in the local business community. "All the winners embody the spirit of enterprise that is key to the future of our economy, as well as a dedication to excellence." He added: "What was also really encouraging was to see how many had built their success on overcoming adversity. That is a true mark of character and distinction." Leslie Buckley, chairman of Independent News and Media PLC, said: "We are thrilled to be honouring such a wide range of companies from start-ups to multimillion pound companies and everything in between. "Hearing what our finalists have achieved has been nothing short of inspirational and makes for a fantastic feel-good event. "That, coupled with the support we have received from our partner Ulster Bank, our category sponsors, our esteemed panel of judges and the general business community, means that our business awards continue to go from strength to strength in their 15th year." There were winners in another 11 categories, including the Excellence in the Development of Management & Leadership, sponsored by B4B Telecoms, which was snapped up by the Progressive Building Society. And the Young Businessperson of the Year category - sponsored by Armagh, Banbridge and Craigavon Borough Council - went to Jack Hamilton, a director of vegetable processing company Mash Direct. Economist John Simpson, who was chairman of the judging panel for the awards, said the panel had been impressed by the achievements of MJM Marine. "All of the winners, in each category, are living examples of what the best of local business can do. Selecting any one as overall winner is a difficult choice. "They are a diverse group, each representing a set of skills or achievements that are a credit to them. However, after a review of the winners, the judges agreed on a recommendation. "The theme of the selection of MJM Marine must be the impressive nature of the achievements of the business in a complex and competitive market. "The success of MJM confirms that a local company can gain contracts in a worldwide contract marketplace." He added: "The evidence of success builds on the supply of special skills against demanding delivery schedules in different locations. The business combines the requirements of skilled labour, successful design specifications, sourcing and delivery of materials, and work flow management, at contract prices that have proved profitable. "As an export-related business this success is a demonstrable achievement for a Northern Ireland-based firm which helps to sustain our reputation for success in many diverse sectors."